The Connected NICU concept aims at supporting family-centered and developmental care, improving parental experience, long-term development and quality of life for the baby. The intense nature of a Neo-Natal Intensive Care Unit exposes the baby to light and noise—disturbing sleep and making it difficult to bond. Our holistic concept minimizes these aspects. Mother and child stay together in the family room. Staff is enabled to coach and involve parents. A parental portal provides information, tools and services. 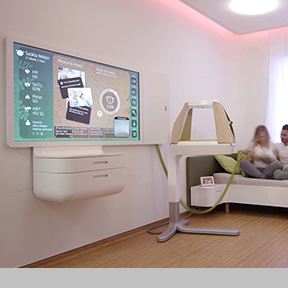 The ‘cradle’ concept creates an optimum micro-environment while cameras unobtrusively monitor the vitals. A smart snuggle nest enables vital skin-to-skin therapy also known as kangaroo care. A patient centric workflow guides staff around the infants sleep cycles and can predict emergency events. Monitoring and life support systems are integrated in a headwall, bringing information together to provide a new level of care.